pure coat Cleaner has been developed to clean your materials after applying a pure coat Sealer. Materials include paint brushes, paint trays, rollers and spraying equipment which can be used again once cleaned with the pure coat Cleaner. 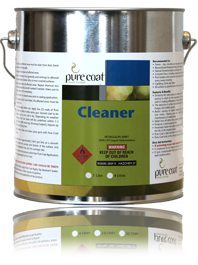 pure coat Cleaner can also be used to remove marks from an already sealed surface. The pure coat Cleaner will remove tyre marks and oil spills with light brushing. Care must be taken to not saturate the surface as excess application and harsh scrubbing can damage the seal. pure coat Cleaner can be used on rollers, brushes, paint trays and spraying equipment. Tyre marks can be removed from sealed surfaces using pure coat Cleaner by lightly brushing the surface. Care must be taken not to saturate the area as it may remove the sealer.